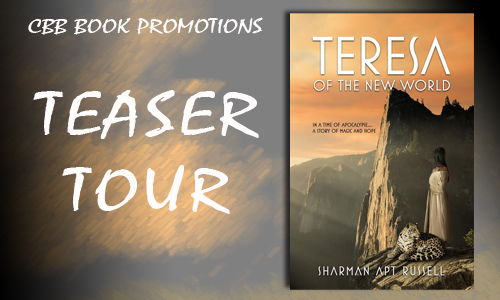 Welcome to the teaser tour for Teresa of the New World by Sharman Apt Russell! Teresa of the New World is a young adult/new adult historical fiction with fantasy elements and is available for sale through most book stores. In 1528, the real-life conquistador Cabeza de Vaca shipwrecked in the New World where he lived as a slave, trader, and shaman.In this lyrical weaving of history and myth, the adventurer takes his young daughter Teresa from her home in Texas to travel to outposts in New Spain. Once there, Teresa is left behind as a servant in a Spanish household. But when an epidemic of measles devastates the area, the teenager must set off on a new journey, listening again to the voices of the desert, befriending a war-horse and were-jaguar, sinking into the earth to swim through fossil and stone, reclaiming her power to outwit the cunning figure of Plague. A story of apocalypse and hope, Teresa of the New World takes you into the dreamscape of the sixteenth-century American Southwest. It took me twenty years to write Teresa of the New World, a reflection of my long time obsession with the Spanish conquistador Álvar NúñezCabeza de Vaca, with the numinous deserts of the American Southwest, with the dreamscape of the sixteenth century, with the deadly diseases unwittingly brought by the Europeans at the time of First Contact, with the complexities of the hero father, with deep earth magic, with were-jaguars, with all that and more. Supposedly this is the story of Teresa, daughter of a Capoque mother and a Spanish adventurer. But really I think it has become my autobiography. In 1528, the real-life conquistador Cabeza de Vaca shipwrecked in the New World where he lived for eight years as a slave, trader, and shaman. Later, he wrote about those years in a report to the king of Spain, and that account—rich with details about the tribes of Texas and how they lived–has always fascinated me. In my retelling, the Spaniard takes his young daughter Teresa from her home to walk with him toward the setting sun, west to the outposts of New Spain, their travels accompanied by miracles–visions and prophecies. But when Teresa reaches the outposts of New Spain, life is not what her father had promised. As a kitchen servant in the household of a Spanish official, she grows up estranged from the magic she knew as a child, when she could speak to the earth and listen to animals. When a new epidemic of measles devastates the area, the sixteen-year-old sets off on her own journey, befriending a Mayan were-jaguar who cannot control his shape-shifting and a warhorse abandoned by his Spanish owner. Now Teresa moves through a land stalked by Plague: smallpox as well as measles, typhus, and scarlet fever. Teresa lived in a time of apocalypse and hope, of magic and change—and I think we live in a similar time. She had to let go of fear. She had to let go of anger. Living in her world was a wonderful and profound experience for me. I would love to hear your reactions or thoughts to any aspect of Teresa of the New World. And I would be pleased to post your comments, stories, and drawings on my website. Just contact me at www.sharmanaptrussell.com. Sharman Apt Russell has lived in the beauty and magic of Southwestern deserts almost all her life and continues to be amazed by that. 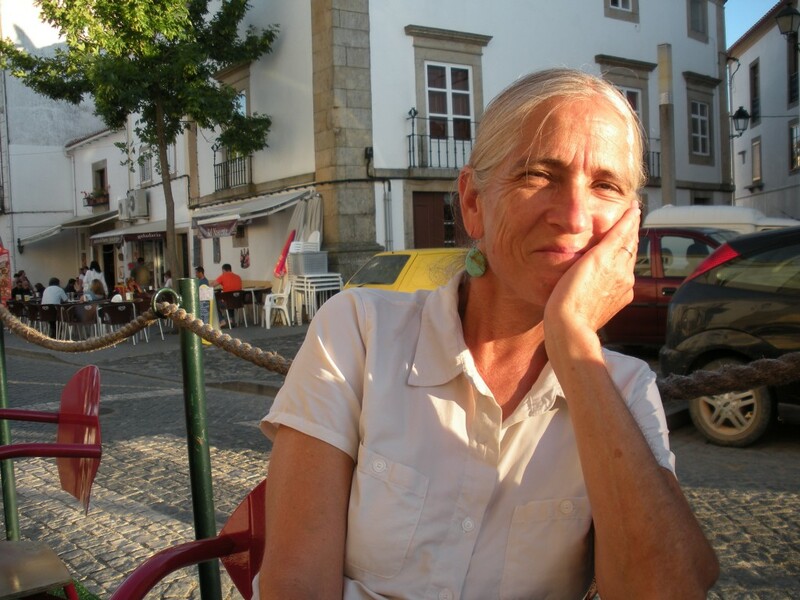 She has published over a dozen books translated into a dozen languages, including fiction and nonfiction. 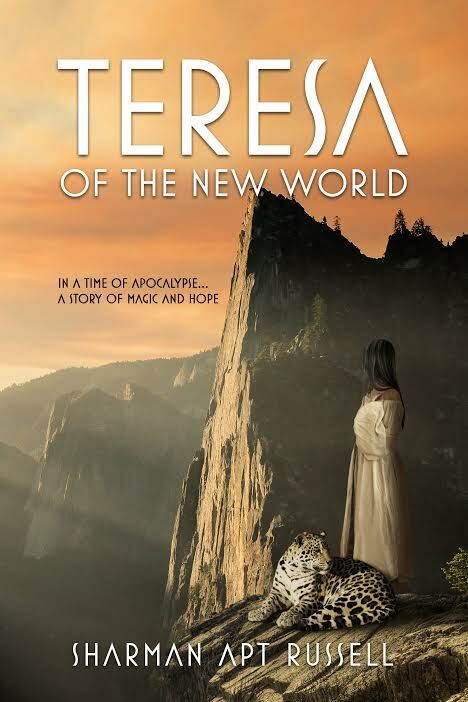 Teresa of the New World is her third middle-grade and young adult novel.